Democratic Senator Ben Cardin took the Maryland primary this week with more than 80 percent of the party’s votes, winning in a landslide over challenger and convicted leaker Chelsea Manning. “Chelsea,” as Bradley now calls himself, committed ~750,000 acts of treason in the largest intelligence leak in US history. No one will ever know how many lives were lost as a result. Sensing a kindred spirit, Barack Obama commuted his sentence. Manning is a hero among liberals, but even the same Maryland Democrats who inflicted Martin O’Malley upon the country have higher standards than to vote for him. However, he might have had better luck if he had run in New York, where he was featured in a parade. 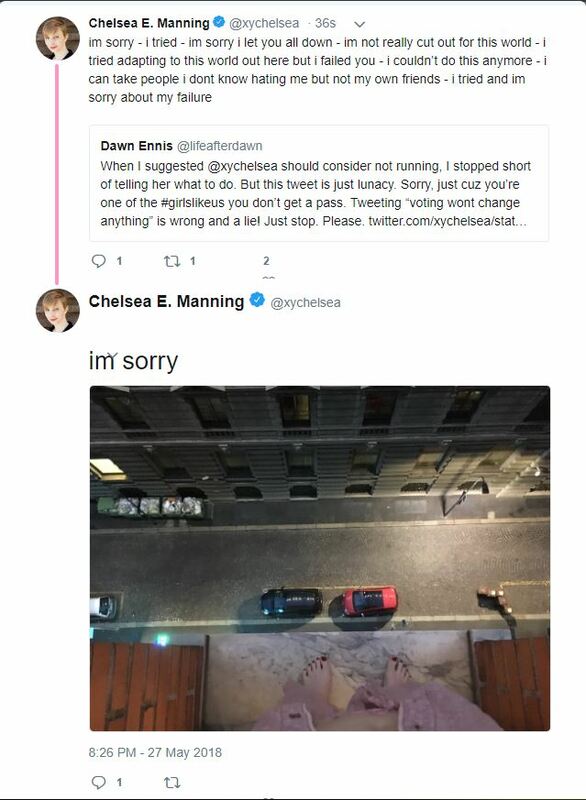 Let’s hope the disappointment doesn’t get him back out on that ledge — always assuming that the picture he posted of his ludicrously painted toenails with a street far below wasn’t a pathetic bid for sympathy.